The most dramatic transfer in the history of Russian ice hockey has happened: 30-year-old forward Ilya Kovalchuk has cancelled his multi-million contract with the New Jersey Devils and is moving to SKA Saint Petersburg. Yesterday evening Ilya Kovalchuk broke his contract with the New Jersey team, which was due to last for another 12 years and was worth 77 million dollars. In order to cancel his contract by mutual agreement, the forward was obliged to sign papers stating that he was ending his career in the National Hockey League (NHL) and would not move to another club within the league. 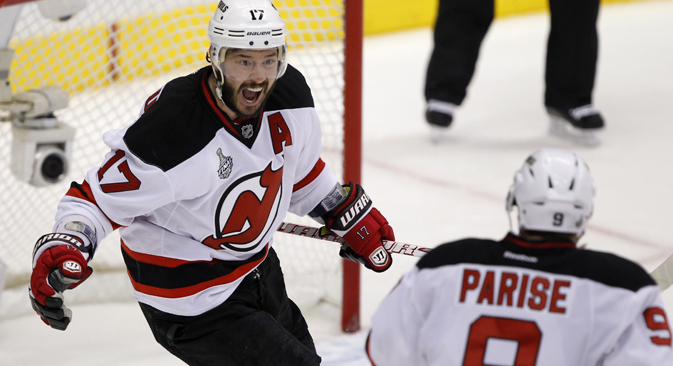 Kovalchuk is now expected to sign a contract with Russian team SKA Saint Petersburg. Kovy, as he is affectionately referred to by his fans, will be earning a salary of at least 10 million dollars net with the Kontinental Hockey League (KHL). “On the one hand I think it would be better for Ilya to stay in America,” the mother of the player, Lyubov Kovalchuk, told RBTH. The beginning of the “Kovy, the KHL and the 10 million dollars” saga dates back to the summer of 2010. At the time, as the star forward’s contract with the Atlanta Thrashers ended, he spent a long time trying to choose between the NHL and SKA. Ilya nearly headed off for Los Angeles, but in the end New Jersey offered more money than the Kings, while the SKA and KHL president Alexander Medvedev couldn’t find any arguments strong enough to persuade his favourite to return to Russia. That might have been the end of the story - but then the lockout erupted and Kovalchuk moved to St Petersburg for six months. In January the NHL season resumed, but something had gone badly wrong in Ilya’s relationship with the Devils. The forward would turn up late for training, as the team made a mess of the regular season and failed to get into the playoffs. Additionally, Kovalchuk and the other players didn’t get paid for a month at the end of the season due to the financial troubles of club owner Jeffrey Vanderbeek. “Ilya thought about quitting during the lockout and before he returned to the NHL that season. We didn’t talk about this during the season. Ilya recently returned to this topic, saying he wanted to go back to Russia. That was the player’s decision, not the club’s. What can I say? Nothing surprises me any more in the NHL these days!” said an emotional Lou Lamoriello, the New Jersey Devils’ general manager. And so Kovalchuk is off to SKA. The general feeling, shared by experts and fans alike, is that the St. Petersburg club will now be the favourite to win the Gagarin Cup, the trophy presented to the winner of the KHL playoffs. What’s more, this move has brought Ilya much closer – both literally and figuratively – to the Russian national team’s coaching staff. Considering that he performed excellently in the last world championships and that in sporting terms he is on his way to become the number one in the KHL, he’ll be the one that everyone is relying on emotionally and mentally at the 2014 Winter Olympics in Sochi. Kovalchuk’s move will presents some obstacles for him and his family. While someone like Alexander Ovechkin, a bachelor, in principle can easily turn his life around 180 degrees, Kovy has much more on his plate. Married to Nicole Ambrazaitis, former singer of the band Mirage, he will also have to take into account the practicalities of relocating with his wife and his three children - Karolina, Filipp and Artem. “Ilya and his family are currently at their home in Miami, and he’ll fly back to Russia in August as usual. He’ll have to sort out a few things before Nicole and the children arrive. I don’t think there’ll be any problems on the domestic side. My grandchildren come here every year for the holidays and they like it here. At first they aren’t used to hearing everyone speaking Russian all around them, but they soon get used to it. The oldest girl, Karolina, has been at school for two years in America, and in St Petersburg she’ll go to the American school,” said Lyubov Kovalchuk.